Were you ever in an accident with another driver who was at-fault for the collision but struggled to prove this in court? Having a mounted dash cam on your vehicle can spare you the pain of a convoluted court case, especially if you are making claims for serious injuries related to the accident. Given the frequency of major auto accidents, investing in a dash cam is useful in scary scenarios. Also, you might just happen to viral video-worthy footage of random events as you drive. 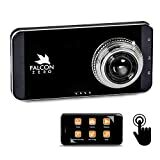 Are you looking for a dash cam with a wide array of useful features? Look no further than the Rexing S500 Pro. The S500 Pro gets 1920x1080P frontal and 1280x720P rear resolutions. The front lens rotates 180 degrees vertically and 30 degrees horizontally, while the rear camera rotates 180 degrees as well. This rear camera rotation allows the cam to cover either a view of the vehicle’s interior or the rear view. This highly-versatile cam features a 170-degree 6-layer lens and a rear camera discreet design. Images are saved as .JPG, and videos are saved in .MOV format. The S500 also has USB and audio recording support. Sleek, sophisticated, and compatible with both iOS and Android devices, the Pruveeo F5 will reel you in with its WiFi capabilities and non-stop recording while your engine is running. Users can set up, view, and download HD video in real-time. The Pruveeo F5 has a 1280×720 resolution and captures 30 frames per second (fps). The cam is also to save the last-recorded video if a software crash occurs, so you will not lose a lot of footage as you might on other cams. The Pruveeo F5 holds up well in extreme cold, heat, and humidity since it uses a 3M tape. Looking for a cam that has multi-vehicle use and offers 24/7 surveillance? 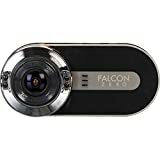 The Falcon Zero Touch PRO is a small device that looks more like a point-and-shoot digital camera than a dash cam. This dash cam allows you to look at your speed, the weather, and Google Maps. It gets full HD 1080P and can hold data on microSD cards ranging up to 64GB. The Falcon weighs only 2.2 pounds, so it can be securely mounted without much issue. 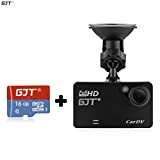 If you’re looking for seamless, high-quality 1080p/720p video quality from your dash cam, the GJY T161 provides clear and continuous real-time video. Unlike other dash cams, you can easily read license plate numbers, which can be helpful in the event of an auto accident. 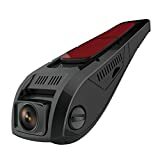 This cam features motion detection, cycle recording, and one LED infrared light for night vision. You can view immediate playback on the monitor and charge the device at home or in the car. Recording time lasts up to 14 minutes before a new video starts. This 11.2-ounce dash cam looks tiny but really stands out among budget-priced dash cams. The camera has a 2.31-inch LCR screen and a 140-degree wide angle lens view. Videos can be recorded in M-JPEG and AVC1 formats, and there are 1-, 3-, and 5-minute video saving intervals. You will have to turn the G Sensor off if you wish to continuously record at 10-minute intervals since it picks up on every bump in the road. 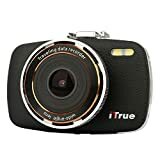 The ITrue X3 is a sleek dash cam with a lot of beneficial features. There is an Emergency Lock Button and G-Sensor that save a current file to memory when an accident is detected. The cam gets excellent night vision with its Wide Dynamic Range video system and 170-degree 6-layer lenses. The best thing about this cam is that its stitched-leather body reduces glare. Fans of Falcon cams will love the F170HD+’s solid recording performance. It has GPS capability, Full HD 1080P that records 30 fps, and outstanding night vision. You will not get confused by a complex menu since every icon is clearly labeled. You can record about 500 minutes of video on a 64GB micro SIM card when you select the 5-minute recording interval option. The Lumina is the ninja of the dash cam world. Both powerful and stealthy, the Lumina has 6-layer lenses crafted by Nikon and a Sony CMOS sensor, assuring that the parts are crafted with quality in mind. This camera might look large in some photos but is actually quite small and easy to place on your rear-view mirror. 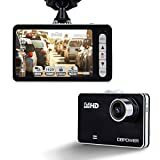 The DBPOWER, like many other dash cams on the market, has a G-Sensor that auto-detects accidents and has multiple features that are easy to use. Unlike other cams, the DBPower comes with a 12-feet-long power cord that can be easily routed throughout a vehicle, thereby making it look very inconspicuous to anyone outside the vehicle. On a 32GB SD card, you can get up to 2.5 hours of recorded video. 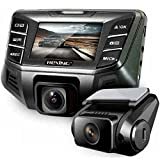 At the top of this list is the Rexing V1, which is hailed as one of the best budget-friendly dash cams by customers. The V1 gets impeccably clear video and still photo quality and performs well in low-light situations thanks to its 170-degree Wide Dynamic Range technology. This cam can hold up to a 128GB Class 10 memory card. Images save as JPG, and video files save as .MOV, making them easily transferable to a computer. If you’re browsing different dash cam options, there are a few key features you should be looking for. A good cam will have high-definition 1080P or 720P video recording at 30 frames per second (fps). Cams should also be discreet to anyone outside the vehicle. 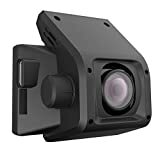 Also, you should look for cameras that are able to withstand temperature extremes and that have lengthy power cords since you will be routing these throughout your vehicle. There are three types of dash cams available. Basic dash cams are generally hard-wired into your vehicle’s power system or can be plugged into its cigarette lighter. They generally have built-in and removable storage that can be transposed onto computers. Some dash cams are more advanced and feature GPS, audio recording, and G-Sensors. 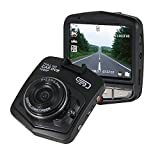 Finally, some dash cams are actually dual-cameras, meaning that they have both front and rear-view recording abilities. 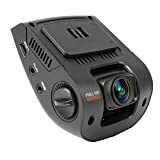 No matter which dash cam you choose, all of these cameras are generally affordable for the average consumer and have good warranties from their companies. Many drivers own more than one dash cam and like to try different brands in order to find what works best. The one thing all users agree on is that having a recording dash cam saves a lot of hassle in case you get into an accident.